Every time it comes around, the G20 summit attracts protesters of every stripe. The G20 gathers the governments and central bank governors of 19 of the world’s largest economies plus the European Union (EU). From its inception, it is a self-appointed group that intends to set financial and economic guidelines for the world. The voices of those at the margins of economic power - a majority of the states as well as civil society - are left out. 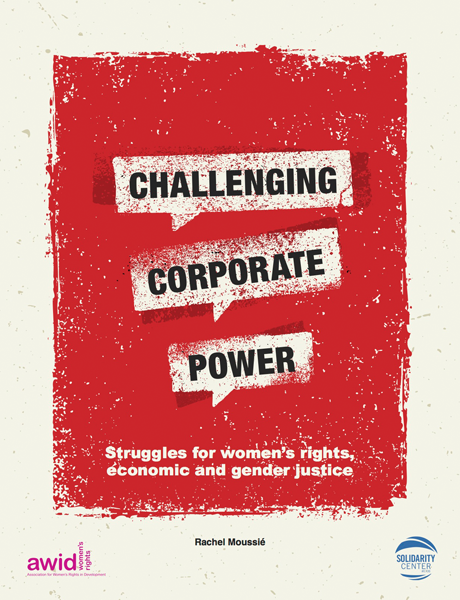 Meanwhile, transnational corporations play a central role within the G20 in influencing recommendations and decisions, including those around women’s economic empowerment. Representatives of the International Monetary Fund (IMF) and the World Bank are among the regular invitees. Together, they push for free trade regimes and economic growth as the main agenda drivers rather than respect for social and economic justice and human rights. Indeed, despite popular belief, ‘economic growth’ and increased Gross Domestic Product (GDP) do not equal better living conditions for the people, and free trade and investment agreements have proven to have destructive effects on people’s lives and the environment. In other words, the G20 is a vehicle of neoliberal globalization that benefits the few and the extremely wealthy at the expense of the rest of us. This year's summit, which takes place in Buenos Aires, from November 30 to December 1, 2018, has already mobilized social movements, including feminist movements, from the region and beyond to resist the G20 neoliberal agenda. Prior to the official G20 meeting, a week of action is being planned. The Feminist Forum Against the G20, a coalition composed of Latin American feminist, working class, migrant, indigenous, peasant, afro-descendant, lesbian, trans and queer movements and communities is leading a vibrant resistance to the summit’s neoliberal agenda. 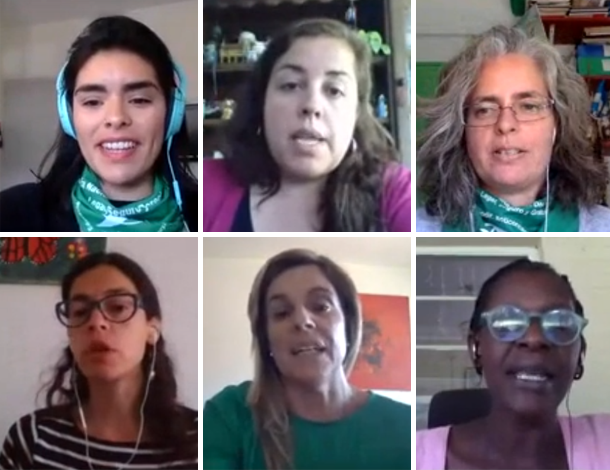 Building from the experience of the Feminist Forum against the World Trade Organization last year in the same city of Buenos Aires, a collective feminist power against neoliberalism is taking shape. The Feminist Forum has called out the G20 for “pinkwashing”, a corporate marketing tactic that uses the appearance of gender inclusiveness to “sell” a positive image rather than proposing policies that would improve the lives of women and LGBTQI communities. MYTH #1: The G20 represents the whole world. The G20 was originally established in 1999 as a forum for 19 governments and central banks to discuss and coordinate economic policy on a global level. The G20 was first attended by finance ministers, and following the economic crisis in 2008, started to include heads of states. 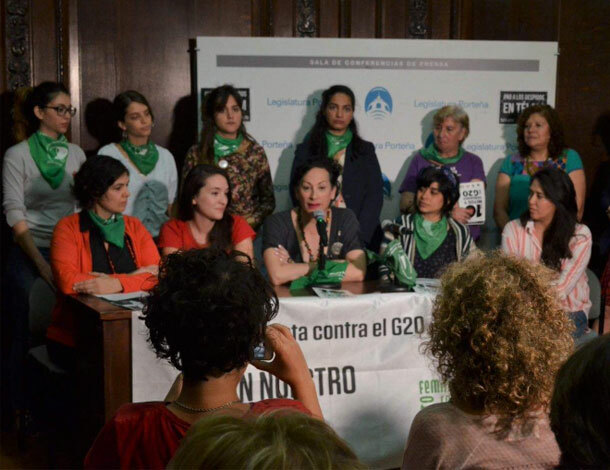 According to Luciana Ghiotto, from Argentina Mejor sin TLC - an assembly of Argentinian organizations against free trade agreements and the Transnational Institute (TNI), the political decisions made during the G20 may not be obligatory, but they certainly have an impact on the absent countries. For this reason, she pointed out the G20’s exclusivity, which it maintains on the basis of concentrating decision-making in the hands of the world’s major economic powers, and their ideological lines. “In reality, you have a small number of countries, such as South Africa, Argentina, and Mexico, representing whole continents (Latin America and Africa). In fact, what we find about the “representing” countries is that they are US-friendly, but do not have the actual capacity to represent whole continents,” critiqued Luciana. MYTH #2: Gender has increasingly become a concern on the G20 agenda. Like others before it, the upcoming G20 frames “corporate women’s success stories” as women’s economic empowerment in general. This narrow view completely disregards the devastating impact of G20-advocated neoliberal economic policies, like austerity and privatization, on women’s lives and gender inequalities. As Corina Rodrígues Enríquez from Development Alternatives with Women for a new Era (DAWN) observed, cutbacks to public spending in key sectors like healthcare and education hit women the hardest and prevent them from realizing their human rights. Rather, the prevailing view advanced by the G20 is one “focused around corporate social responsibility rather than the responsibility of the state,” Corina explained. This discourse suggests that women only need to “overcome” the economic hardships they experience, veiling the structural inequalities - gendered, racial and class-based - that are embedded and perpetuated by the neoliberal economy. For this reason, Corina argues, the proposals submitted by the Women20 (W20), an affinity group created by the official G20 to discuss women’s economic empowerment, promote fruitless types of financial inclusion, such as access to credit that would push more women in debt. Furthermore, the focus of the G20 is generally influenced by the country that holds the presidency. This edition of the summit is presided by the government of Argentina, which is currently led by a right-wing and neoliberal party coalition with mostly conservative views on women’s rights. “To give you a feeling of this perspective; the current person who leads the W20, is Susana Balbo, a wine-industry businesswoman who left her parliamentary seat to do this job. If she had held her parliamentary seat during the discussions around legal abortion, she would have voted against it.” said Corina. But this is a well-worn tactic used by corporates and states to misrepresent their intentions on gender equality, according to Corina: “There is a strong tendency of pinkwashing - the appearance of being concerned for women without a real respect for women’s human rights,” she added. Business20, or the B20, presents itself as the “private sector´s voice of the G20 community”. Their deliberations are troublesome if we consider the fact that the world’s largest corporations are based in G20 countries (particularly in the North, but also in Japan and China) and have more economic power than many countries. The B20 group that met in Buenos Aires in early-October 2018, agreed on a communiqué that revealed the private sector’s desire to participate in international development agendas. Reflecting on the language of the document, Fernanda Hopenhaym from PODER, said, “It had recommendations that seemed progressive, such as ‘inclusive employability’, but if you try to unpack the content of that communiqué, they are looking for ‘simplicity, transparency, and flexibility’ in their employment practices, so that they can ‘participate in the development agenda’”. This might sound innocent or even good-willed, but the B20’s composition should be addressed first to understand its real interests. Corporations and economic elites benefit from enormous wealth, and have a clear agenda against its redistribution and against social welfare and environmental protection policies. No less concerning is their desire to transform their economic power into political power in intergovernmental forums such as the G20. Out of 54 countries, South Africa is the sole member of the G20 that “represents” the African region. Let that sink in. Reflecting on the impact of G20 deliberations for the region, Nancy Kachingwe, an independent policy advisor, noted a colonial and imperial continuum. “There is still a scramble for Africa, and we see that many of the different powers in the G20 see the continent as a sphere of influence and would like to access its resources. This raises the question about whether this G20 summit represents a new Berlin Conference, to divide up the continent. From a pan-Africanist perspective, we need to act collectively and use our own influence.” Nancy remarked. According to Nancy’s observation,“ the G20, cannot substitute the decision-making that African countries may have in multilateral spaces. On the other hand, she argued that the G20 might become useful to the continent if it uses the economic power of its members to regulate the financial system, particularly in relation to the trend of Illicit Financial Flows - illegal movements of capital and wealth out of Africa - that have serious impacts on gender justice and the region’s overall development. From Toronto to Hamburg, the mainstream media has often portrayed counter-G20 actions as disorganized and destructive, often dismissing them as “violent Black Bloc tactics”. On the contrary, civil society movements from Argentina and abroad are coordinated, productive, and ready to confront the G20 in a way that make their demands clear. They are currently preparing public mobilisations to denounce the G20, IMF and World Bank neoliberal agenda in a week of action ahead of the official G20 Summit, from November 25 to December 1st in Buenos Aires. The Feminist Forum against the G20, as part of this organizing, is situated in growing feminist momentum of resistance to neoliberalism and the drive towards alternative economies, grounded in social, economic and gender justice. “We have been hearing a lot about different agendas and actors, but in order to describe how women have been mobilizing, I need to go back to December 2017, a time when we organized a feminist forum against the WTO, where we created a space to educate ourselves around the new wave of trade agreements in our regions, and on the alternatives. Women gathered within the people’s summit to understand and educate ourselves. We gathered in a diverse space. We had women from all over the world, rural women, urban women, women from the sexual dissidents movement, women who were active in different trade unions. It was a diverse space that gave us evidence that there was an appetite for developing alternatives.” affirmed Alejandra Scampini from DAWN, Uruguay. Watch the webinar "Feminists on the Road to the G20"
Would you like to engage in the feminist mobilisation to resist the G20?